EDGECAM Wire EDM provides the flexibility and confidence to manufacture 2 and 4 axis parts accurately and efficiently. Advanced functionality enables manufacture of complex shapes with irregular tapers easily. The 2 and 4 axis machining operations give the user a choice of parameters such as machining direction, auto offsetting, lead on/off radius, tag distance, lead off distance, lead on/off technology to name just a few. Each parameter is accompanied by a bitmap giving the user additional information on how it will affect the resultant toolpath. 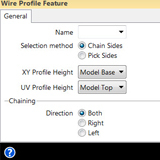 In EDGECAM Wire it is possible to select from several different methods of unattended machining. If your machine is equipped with automatic wire threading, then you will most likely want to run unattended as long and as often as possible. Unattended machining is performed by leaving the slugs attached while all of the preliminary cuts are taken. Numerous strategies are available to cut the part; for instance, taking all of the rough cuts before finishing, in which case all rough cuts are taken while leaving the tags attached, then the tags are removed, and finally the finish cuts are taken. Alternatively, take the rough and finish cuts while leaving the component or waste material in place and then remove the tag and finish this area. Feature Finder will automatically identify regions which require Wire EDM machining on solid models. Multiple features can be created within a single transaction plus, the feature can either be a plane 2D shape or a 3D contour. 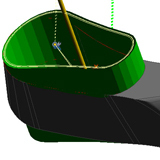 Furthermore, the feature shape will automatically update if the solid model is modified. EDGECAM Wire supports a comprehensive range of EDM machines from leading Machine Tool manufacturers including Agie, Charmilles, Brother, Fanuc, Hitachi, Makino, Ona, Sodick, Seibu and Mitsubishi. Machine Tool supplied technology data is also included for supported machine tools together with JOB/Script file output for Agie and CMD file output for Charmilles. The advanced post processors are easily configured to suit different machine models and configurations. Automatic approach and retract technology to allow power to be ‘ramped’ up and down gradually.